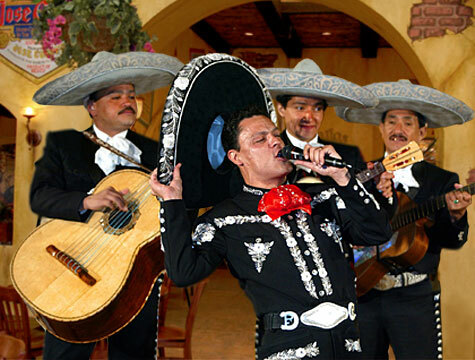 Live mariachi band every Friday night! There's a little Tex-Mex place around the corner from my apartment. Years ago it was called something else, then I think "Tres Amigos" for many years. More recently it came under the moniker "Hacienda Sauza." Clearly, somebody–likely named Sauza–bought and refurbished the place, adding a bit more class and a heavier emphasis on the "Mex" side of the cooking. Despite living within walking distance of this restaurant for more than a decade, I had never eaten there before today. I was always a finicky eater until a few years ago, and even now I have my trepidations and a few absolute moratoriums: no seafood, no mushrooms, no peppers, no onions, nothing that looks like it did when it was still alive. Barring the first and last, those rules typically do a pretty decent job of keeping me away from Tex-Mex. I don't even remotely like hot/spicy dishes, but I'm improving, giving old foes a chance. After all, the taste buds I have now are completely different fleshy bits than the ones I had as a kid. Tastes really do change. So I gave them a shot. I had a friend up from Long Island and we went out to this place and it was a quiet, wonderful meal of good, authentic food served by good, authentic Mexicans. (Not the "MexiCans" who run every fast food place around here, mind you; they're mostly Ecuadorian. No, these guys were Mexican. At least the owner Mr. Sauza was.) My friend got roast pork tamales and I had a trio of cheese, beef and spiced chicken enchiladas with rice and smothered in mole sauce which, for the uninitiated, is spicy chocolate sauce. We split a strawberry margarita and some flan for dessert, and I can honestly say I have never had better flan. Honestly, aside from a lousy turn exiting the place, it was the best restaurant I've been to in a while. Why the hell was I ever so averse to going there? Oh, right, the huge bill. Jesu, that place is expensive. Holy hell, man. I'm broke. I can't be affording that crap on a regular basis. From now on this place is strictly a First Date establishment only. On the upside, it's been twenty minutes and a whole teeth brushing, and my mouth still burns pleasantly from delicious leftover enchilada. Well played, Mexican food. You are as delicious as agave nectar and as crafty as tequila, the way it sneaks back up on you after you thought you'd done the right thing and said you'd had enough. 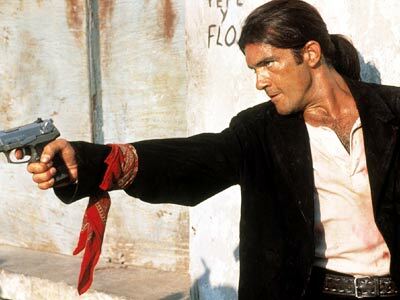 This is a different "El Mariachi." He does not make a live appearance every Friday Night.